Image: Howard Chandler Christy (American, 1873-1952), “Gee!! I Wish I Were a Man,” 1917. Courtesy Bruce Museum. America’s involvement in the First World War was brief, but intense. For a period of 20 months, the government did its best to stir patriotic fervor, in part through the use of eye-catching propaganda posters. A new exhibit at Bruce Museum is showcasing a selection of these works, many of which are seriously lacking in nuance. The new exhibit is called Patriotic Persuasion: American Posters of the First World War, and it features a selection of posters donated to the Bruce Museum by Beverly and John W. Watling III. Image: Howard Chandler Christy (American, 1873-1952), “Fight or Buy Bonds,” 1917. Courtesy Bruce Museum. “I think World War I posters symbolize the merging of patriotism and advertising in the United States, and in many ways, serve as a precedent for our contemporary political propaganda,” Elizabeth D. Smith, Zvi Grunberg Resident Fellow at Bruce Museum, told Gizmodo. Image: “Are You 100% American?,” 1917 Sackett & Wilhelms Lithographing & Printing Company, courtesy Bruce Museum. No doubt, these old-timey posters were designed to persuade, leveraging various psychological techniques to drive the message home. Image: Gordon Grant (American, 1875-1962), “Will You Supply Eyes for the Navy?,” c. 1917-18, courtesy Bruce Museum. Images of attractive women beckon men to enlist, while a blindfolded sailor pleads for donations of spy-glasses and binoculars. Image: Howard Chandler Christy (American, 1873-1952), “Gee!! 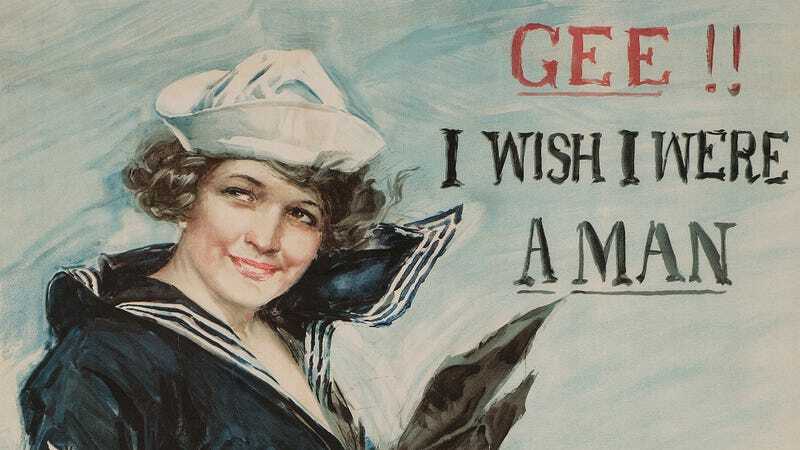 I Wish I Were a Man,” 1917, courtesy Bruce Museum. Citizens who don’t purchase liberty loans are accused of being un-American, and men who don’t enlist are called unmanly. The Statue of Liberty is seen engulfed in flames—Lady Liberty’s decapitated head lying below—as German biplanes fly over head. Images like these exploited the population’s deepest fears. Image: Joseph Pennell (American, 1857-1926), “That Liberty Shall not Perish,” 1918, courtesy Bruce Museum. “Must children die and mothers plead in vain?,” asks a poster for Liberty Bonds. These posters seem benign by today’s standards, even a bit quaint, but as Smith aptly pointed out, we’re not immune to these manipulations. Our sensibilities and causes may have changed, but attempts at public persuasion still abound, whether it’s accusations of “fake news” or the deliberate planting of misinformation on the internet. Image: Herbert Andrew Paus (American, 1880-1946), “To Make the World a Decent Place to Live In,” 1918, courtesy Bruce Museum. The posters shown here are just a sampling of what’s available at the Bruce Museum, located in Greenwich, Connecticut. The exhibit runs from January 20 to June 3, 2018. If you’re around tomorrow (Saturday January 27), the museum will be hosting World War I Digitization day, allowing residents to memorialize the war by digitizing images, documents, letters, and medals. And from January 27 to May 20, the museum will be hosting an exhibit called, Hot Art in a Cold War: Intersections of Art and Science in the Soviet Era.